The second version of a great logic game you all loved is here and the goal is pretty much the same. You have to make sure the sugar drops into the cups. Guide the stream of crumbles into the cups and make sure you fill all one hundred pieces in one cup before moving to the next one. Sometimes you will have to make sure the drops fall through a coloring gate so they will tick the counter of the colored cups. Move fast and try not to lose too much of it on the way. Use the mouse to draw lines on the screen. 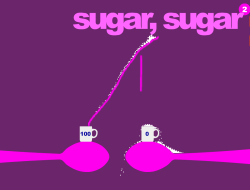 Sugar Sugar 2 0.00 between 0 and 10 based on 0 votes.